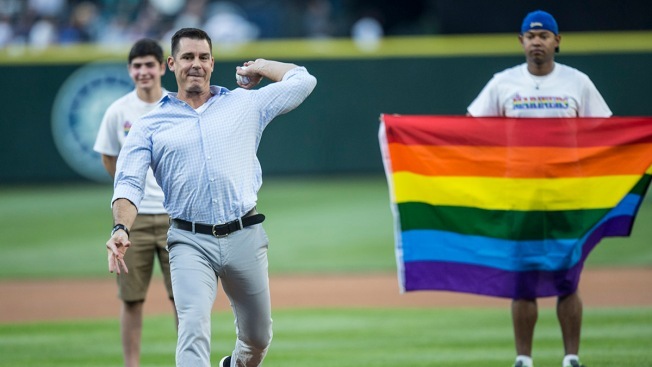 In this Aug. 19, 2016, file photo, Major League Baseball's Ambassador for Inclusion Billy Bean throws out the ceremonial first pitch during Pride Night before game between the Milwaukee Brewers and Seattle Mariners at Safeco Field in Seattle, Wash.
About two years after the New York Mets hosted their first LGBTQ pride night, the New York Yankees have still yet to hold a comparable event. They’re the only team in Major League Baseball that hasn’t hosted a pride night and doesn’t have one scheduled, according to NBC News. This week, the Los Angeles Angels announced plans to host an LGBTQ pride night in June 2019. They were the only other team in the 30-team league that hadn’t hosted or scheduled a pride night. “It's going to be real hard to look in the mirror and see themselves as the only team in Major League Baseball that is not holding a Pride Night,” David Kilmnick, CEO of the LGBT Network, a New York-based nonprofit, told NBC News. A Yankees spokesman told The New York Times last year that while the team may shy away from public events that support the LGBTQ community, it does work behind the scenes to advance inclusivity, like working with organizations that support LGBTQ youth.